Happy Friday, everyone! This week's Fashion and Film Friday post is the modern fairytale, "Penelope" starring Christina Ricci and James McAvoy. The fashions in this movie aren't really vintage but they have that old fashioned charm that I just can't resist! Penelope is the story of a modern girl from a wealthy family who suffers from an ancient family curse- she was born with a pig's nose! Horrified by her deformity, her mother locks her away in her room and shelters her from the hateful world outside. In order to break the curse, Penelope must "be loved by one of her own kind" so when Penelope reaches a mature age, her mother hires a matchmaker to try to find a suitable husband for Penelope. Every suitor loves Penelope for her dowry but when they see her pig snout, they jump out a window and run away screaming. Broken-hearted Penelope finally decides to make her way in the world on her own and she runs away from home and eventually finds the truest form of love- love for yourself. 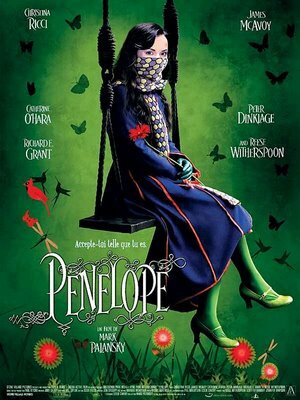 Costumes for Penelope were designed by Jill Taylor but it was really the sets for this movie that stood out for me. I just LOVE Penelope's bedroom! I took a lot of inspiration for Olivia's nursery decor from this movie. Oh, looks lovely! I gotta see that film too! Christina Ricci is gorgeous even with a pigs snout! See you tomorrow! That is such a pretty room. Olivia's bedroom must be beautiful! I've never seen this movie, but it looks good. Must add it to my Netflix queue. Thought of you today! I hit a yardsale with vintage clothing galore!! I got so much stuff in a bunch of sizes but found a great skirt in my size, bright red circle skirt in quilted fabric!! WOOHOO!